Big prawns and small prawns. Giant crevettes and tiny shrimp. Cooked prawns and raw prawns. 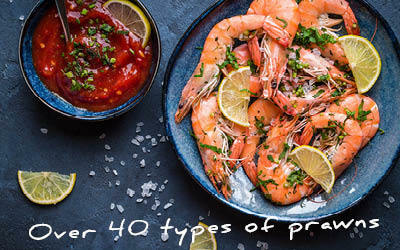 Whole prawns and peeled prawns. King prawns and cold water prawns. Coated prawns and plain prawns. Carabineiros and exoticeroes of every kind... if you can't find it here, we have failed. This is the same prawn as our Best North Atlantic, but it’s still in its shell. Often served in pubs as ’a pint of prawns’. Easy to peel, an exercise which adds character to your meal. A British favourite. Imagine peeling these little guys? They are small, sweet and moreish. These are oven-bake tempura prawns. These are not a gourmet item - just dip-em-in the chilli sauce and gobble-em-up fare. But utterly irresistible. About 30 prawns per pack.